The best, most authentic haircutting training uses live models. Here in New York City, I only use hand-picked live models at all of my haircutting workshops and private classes. Live models are THE only way to learn. Is it straight? Is it wavy? Is it curly? It’s important to know how to approach all different types of hair. Knowing how to read hair is key to any type of haircut, especially short hair and bobs. Reading and understanding growth patterns is fundamental to great short haircuts. If you’re cutting hair on real people, why not train on real people! As soon as you meet your client, you can tell immediately their style and fashion sense. Have the client sit in your chair and look at the haircut they’ve come in with. Is it your haircut? If so, how did it grow out? If it isn’t your haircut, what does it look like? It’s important to know what you’re working with. Knowing how to do a proper consultation. The consultation process builds confidence, trust, and repertoire between you and your client. Trust starts building when you make suggestions to the client on what you think will look great on them. This builds confidence, it trains your eye, and builds repertoire between you and the client. We only use real people, hand-picked by Laara Raynier herself. Train with Mastercutter Academy. Sign up for Laara Raynier’s 1-on-1 private classes or workshops today. I can tell 2018 is going to be a great year ! Personally my feeling is that bangs, bobs and layers are going to be very “in” ! When I’m doing a haircut one of my favorite parts is cutting bangs! They are very poweful, they can really bring out the eyes and the cheek bones, they have a way of changing the whole face! I use my precision technique to a cut the most perfect bangs and I always use the mirror. You can never underestimate the power of using the mirror, it can be the greatest asset to making the haircut look as beautiful as it can. Another reason I love to cut bangs is the artistry involved, especially when I’m deciding on the line of the bangs and the shape!! Not only do I feel bangs will be “in” this year, I know that “bobs” will continue to be the number one haircut. There are just so many variations on the “bob” haircut. I love to do a precision bob haircut, it’s one of my favorite haircuts ever. There is something chic about a classic precision bob haircut. The way it falls, the way it swings and the way it hugs the face! And it never goes out of style. Nowadays there are variations, like the layered bob, the lob, short edgy layered bobs and very short bobs. A bob haircut for everyone no matter their taste and age! 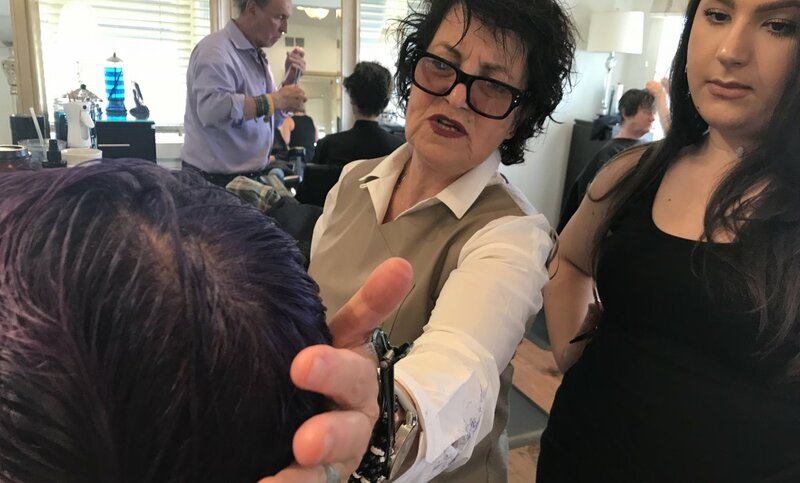 We have a great segment in our”Trade Secrets” workshop called “train your eye” where we show before and after photo’s of haircuts so stylists can decide what they would have done and then see what WAS done. It’s an exciting and inspiring way to train your eye to bring out the best features in a client’s face. 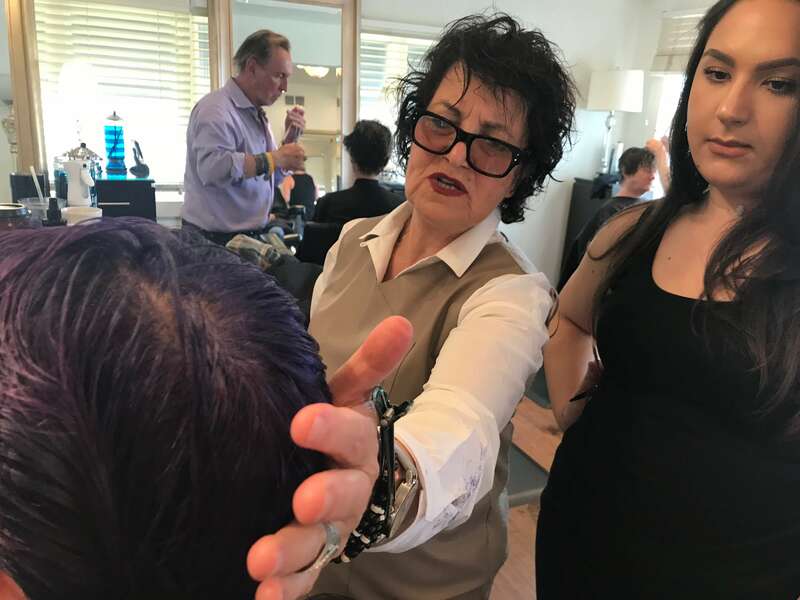 In fact on January 21st 2018 we will be having our “Trade Secrets” workshop at the Damian West Salon here in New York City. I can’t wait!!! Swingin’ London is really swingin’ now! It was so incredibly inspiring being in my hometown, one of the fashion capitals of the world, London! Walking into Top Shop in the West End and feeling the fashion buzz alive and well, was just what I needed. The clothes, the customers and the way they were dressed, it was exciting because it was real wearable fashion. The colors the shapes, what’s in, what’s out. The shoes, the bags, the hats, and the customers, how they dressed and how they looked. I couldn’t get out of there, I spent days there! I took photographs of some the staff and their fantastic haircuts. London for me, is fashion and hair heaven, a place where trends are set, where the energy and passion is all about fashion. Coats are really “in”, bright colors, lace-up platforms & boutique designers. Men’s hair in very short crops. Highlighted hair that’s blue, pink and purple… not boring blonde! I saw more bobs than anything else. All different lengths: short bobs, chin length bobs. However the shorter ones are more fashionable. I spent three days with my friend the incredible genius Tim Hartley ! What a total treat being with him and talking about hair with Tim is like being in hair heaven. He believes as i do that’s what most important is a great haircut. It’s the foundation and basis of shape, form, personality, style and wear ability. A great blow-dry on a great haircut is a great haircut. A great blow-dry on a bad haircut is… a bad haircut! Tim feels its its highly important for every hairdresser to have a mentor and my mentor is Tim Hartley and I’m very excited about it! Next to Roger Thompson, he’s the best hair cutter I know. And I know, because Roger was my first mentor and he trained me.